Ince Blundell is served by two Christian Churches. In the village itself is Holy Family Roman Catholic Church and a few miles down the road in Sefton village is St Helen's Church of England. Click on the links below to visit the Church web sites for times of services and additional information. For the history of the Parish please refer to the history pages. 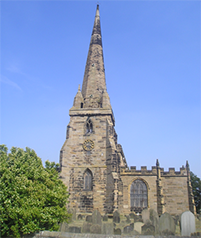 Saint Helens Church in Sefton is one of the oldest Churches in Merseyside dating from 1170. The Church is the only grade 1 listed building in the Borough of Sefton. At St Helen's Sefton services are held at 11.15 am and 6.30 pm each Sunday.